Apartments.com is another apartment hunting resource owned by the CoStar group, similar to ApartmentFinder.com. The team at Apartments.com physically visits more than 400,000 properties around the country, and makes a total of nearly one million calls per month, to verify current listing information. The fees, policies, and other information listed on the website is as accurate as it can be. 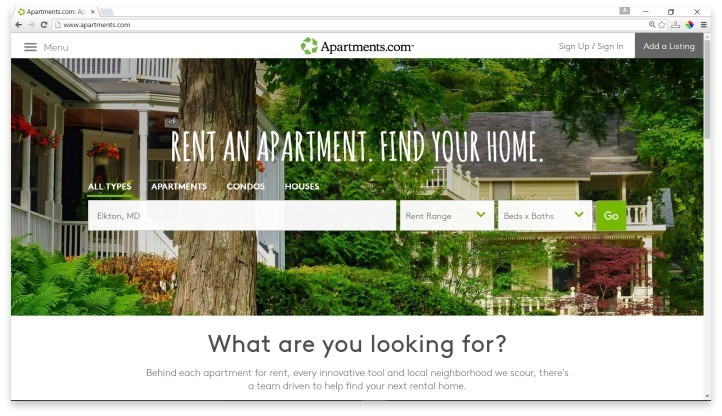 Additionally, Apartments.com is one of the few apartment hunting websites that allows property owners to create a free listing, which connects more renters to more homes on a regular basis. At first glance, Apartments.com looks like a great resource. The website is clean and modern, and there is information front and center about their mobile apps for both iOS and Android devices. They utilize a special feature called the POLYGON search tool, which boils down to using a map to refine your search options. You can also use the “Plan Commute” feature, which helps users who are relocating for work find a home close to their office. Apartments.com does offer users a secure website, so any information you enter is protected and encrypted. This mostly just means that your email address and any searches you do are safe, because there is no payment information necessary for users. You do have to create a membership in order to utilize all of the features, but you can do a basic search without one. When you search for a home, you can narrow it down by the area, the rent range, and how many bedrooms and bathrooms the unit includes. From these options, you can sort the results by low to high or high to low rent, or choose to see only listings with video or 3D tours included. These are the only search functions available to users without an account. Below each listing is a section that allows users to learn more about the specific city or neighborhood, as well as a selection of nearby apartments. This website is unique in that it also shows houses and condos that are for rent, so house hunters have a few more options to compare. However, the listings for comparison underneath a specific unit don’t show prices like many other websites, so you’ll have to toggle over to new tabs in order to quickly compare prices. A huge focus is placed on the POLYGON map feature. Every listing is filled with maps, which show nearby restaurants, banks, or shopping centers; how far away the closest schools are; or where to find the nearest gym. For users who aren’t as comfortable with visual maps, the search function and the listing information may be overwhelming, but there is plenty of written material to make skimming the maps feasible. Apartments.com physically visits more than 400,000 properties around the country, and makes a total of nearly one million calls per month, to verify current listing information. The fees, policies, and other information listed on the website is as accurate as it can be. Apartments.com is another website that would be great for users who have already narrowed their search to a few specific buildings, or who are just starting and don’t know exactly what they want. The trustworthiness of the information is a big bonus for those who hopiing to compare exact prices and amenities, but if you’re still trying to narrow it down by specific features, you may be better off using a more extensive search site. Have you had an experience with this company? Please share your Apartments.com reviews below.